With a week of warm weather on the horizon, it’s very tempting to jump on one of my horses and have some fun. Freedom is ready. I can tell he’d like a good gallop. The problem is, the horses are soft and fluffy. They still have their winter coats and they are really not fit. Last weekend I took Zelda for a 5 mile walk and when we got back, her eyes were at half mast and she was tired. She’s a long way from being ready to foxhunt, but we have time. As Denny Emerson preaches, getting your horse fit before you have fun is an important part of being a responsible owner. The usually unseen, un-talked about, un-glamorous, unknown, under appreciated, but oh so key link between the unfit, soft, vulnerable pasture horse and the horse we see doing “things,”are those days, weeks, sometimes months of walking. Many riders don’t get the critical importance of waiting until the horse is no longer soft before asking hard things. To a soft horse, just trotting around a flat ring can be hard and can cause discomfort. To a soft horse, just having a saddle on an unfit back, and a girth around an unfit belly, can cause discomfort. To a soft horse, just the weight of a rider can cause discomfort. Take that unfit horse—every part of that horse is soft and unused to stress—and VERY CAREFULLY start to introduce stress. Don’t get greedy to have “fun.” Don’t do anything to your horse that you wouldn’t do to your grandmother sitting on the porch in her rocking chair, being a self imposed vegetable. No damn “dressage.” Dressage is hard. No cantering, not yet. Same reason. No jumping. Same reason. So, right now, we’re walking. We are walking briskly (and sometimes beside our horse, rather than on top of him!) about five miles every ride. 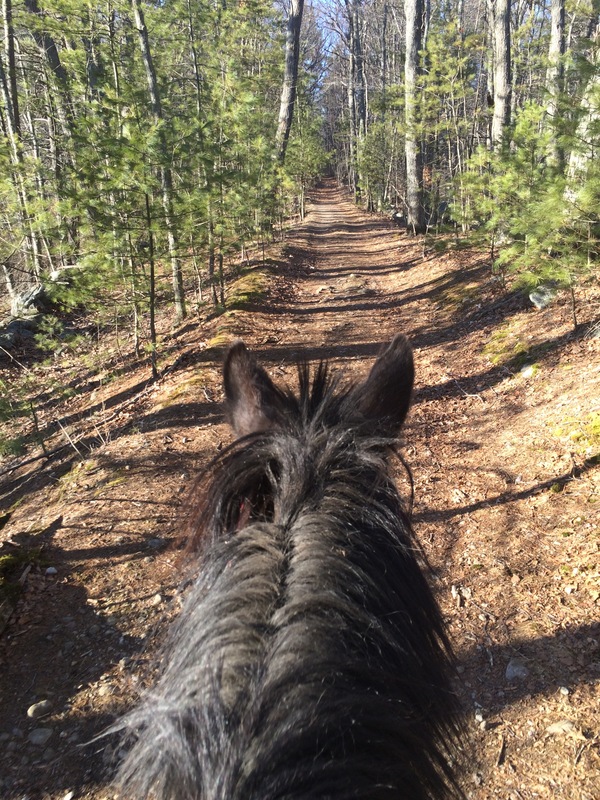 I am thankful that my horses live on such a beautiful trail system because the varied terrain is good for them and interesting for me. It’s a lot of fun to ride the old trails, the ones that used to be roads. 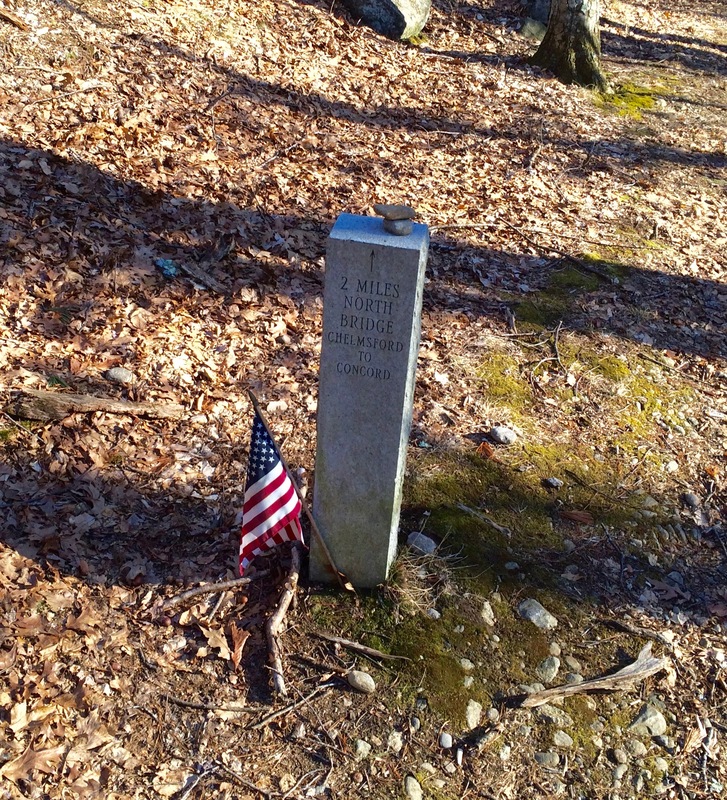 This one has a marker that shows the distance to the Old North Bridge. On Sunday I was riding down a trail that used to be an old road. Last fall I saw an owl there several times and, sure enough, it was there again, flying over us as we disturbed it from it’s nap. I know the spot. It’s just past the marker that shows how far we are from the Old North Bridge — from a time when the Minute Men walked on this old road. But Zelda and Freedom aren’t the only ones who are walking their way to fitness. My daughter has me walking, too. Five miles on the elliptical trainer and a full weight circuit tonight. She wants to be a fitness instructor and I’m her first victim, oops, I mean client. Maybe I’ll be ready for hunt season, too.